But first, let's briefly consider the concept of investor sentiment. My observation is that sentiment's crystal ball, particularly when observed at an extreme, works reliably despite conflicting and clever arguments of either a technical or fundamental nature, and plays the ultimate trump card in foretelling a market's reversal of price direction. Sometimes the occurrence of a high volume "capitulation selling" event provides the most obvious observation of sentiment exhaustion. But there are numerous other means to assess this phenomenon and we will get to these shortly. Sentiment extremes, simply put, tell us that there are too many traders at one end of the boat and therefore the boat is about to tip over. Sentiment can strongly suggest that the trade, as some say, has become "crowded". When someone finally yells "fire" in the "crowded" room there are so many of the market's participants motivated to get out the same door and in the same direction that most get trampled - unable to reverse their trade fast enough. Another way of characterizing a sentiment extreme is to say that the trade simply runs out of buyers or sellers, as the case may be. The extreme price momentum in one direction "exhausts" itself of all available ammunition to continue the trend and is sometimes signaled when someone yells "fire" in the "crowded" room, but often comes to a conclusion unrecognized by most traders as price reverses direction in an unassuming manner. Yet another saying is "when everyone is thinking the same thing, then no one is thinking". The sentiment indicators we will look at today will give us a clear sense as to whether this saying is potentially a significant and foretelling factor in future precious metal price movement. And yes, there are indeed two players for each trade - the buyer and the seller. In our present precious metals situation, this leads us to consider the concept of shares moving from "weak" hands to "strong" hands. The Claude Resources (CGR) shares I have been accumulating and holding with a considerable draw down are in "strong hands". Barring some unanticipated but significant company news, I have resolved to not sell any of my position even if price should continue to fall from the current $0.30 per share to $0.10. However, as Claude Resources share price has fallen from about $1.00 last September to around $0.60 last January and just a couple months ago $0.50, obviously there have been too many shares of CGR still held by "weak hands". This will change because when the last "weak hand" is willing to sell their last share at this incredibly exaggerated market price that, obviously, will be the bottom. You may have heard comments when a particular market bottoms and then begins to trade higher and then continues to trade even higher yet, despite "bad" news, the assertion that the bullish price movement seems to make no sense - that it cannot possibly be sustained. At this time it appears to nearly everyone the common sense question to ask is how "bad" news that used to cause a market to go into free fall now seems to have absolutely no negative effect? And to observe that as this market continues higher, it always leaves behind those traders stuck in pessimism to declare that the market is "climbing a wall of worry". That is, the "bad" news continues in the media, yet this particular market's price reversal continues upwards. These thoughts are precisely what make this article's argument dead on target, in my opinion. 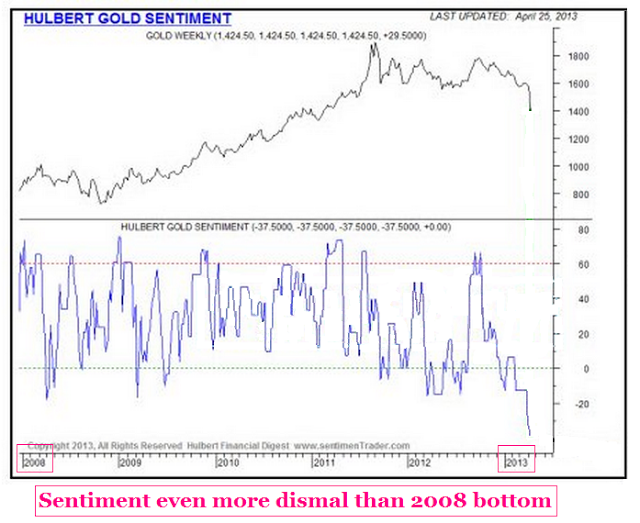 That is, sentiment at extremes can and often does trump both technical and fundamental analysis. 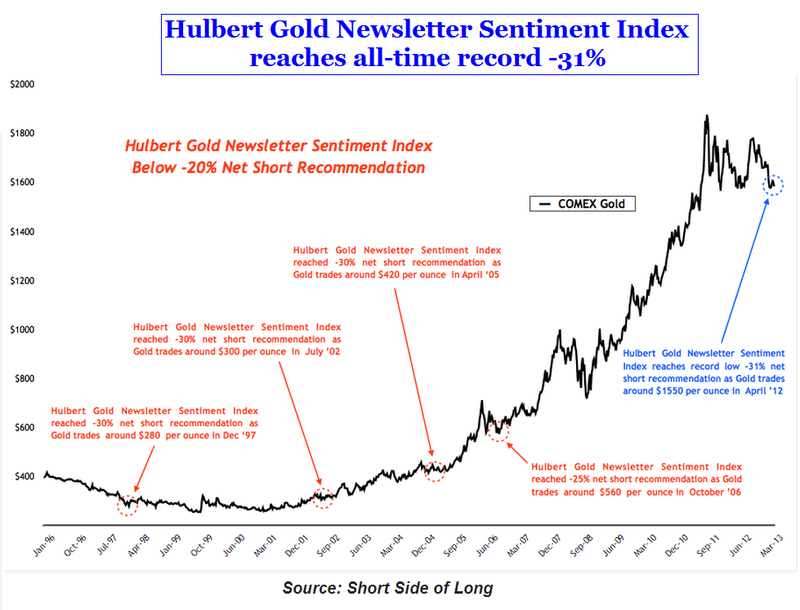 We are about to examine a number of these sentiment indicators which will leave little doubt that the precious metals market is presently at a sentiment extreme of historical proportion. As markets usually swing from one price extreme to another, and markets usually swing from one emotional extreme to another (such as fear to greed), I believe the following sentiment indicators and their readings literally guarantee the continued reversal of gold and silver price to the upside. So let's now take a look at the 5 sentiment indicators I have prepared for detailing the current gold and silver market sentiment and see what they are telling us. 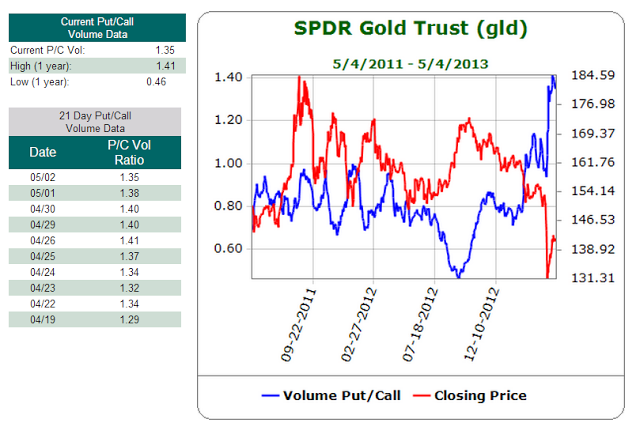 We will begin with the put / call volume ratio of the options trade of the SPDR Gold Trust ETF (GLD) and iShares Silver Trust ETF (SLV). Charts courtesy of Schaeffer's Investment Research. The red line in the charts are the ETF's price movement over the recent 2 years (GLDabove, SLV below). 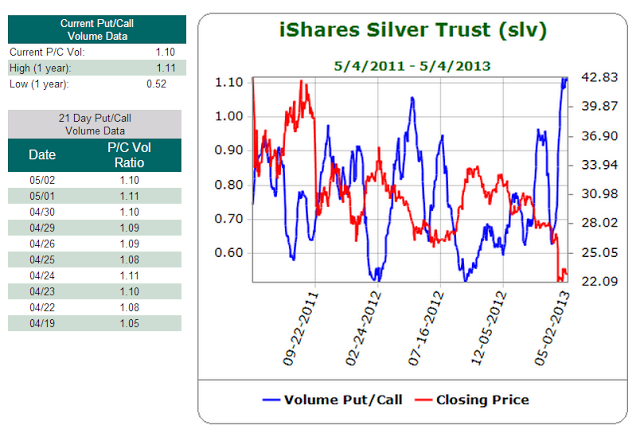 The blue line is the put / call volume ratio. This considers the trading day's volume of puts traded and is divided by the volume of calls traded. Generally, the higher the put / call ratio, the more bearish traders are about the ETF's likely price movement, while the lower the put / call ratio, the more traders believe the ETF is bullish and going to rally higher. The second chart offers a sweeping view of gold's price movement over the past 17 years, as well as the locations of noteworthy extremes of bearish sentiment. And incredibly (and once again) our current bearish sentiment breaks all previous records with a reading of -31%. 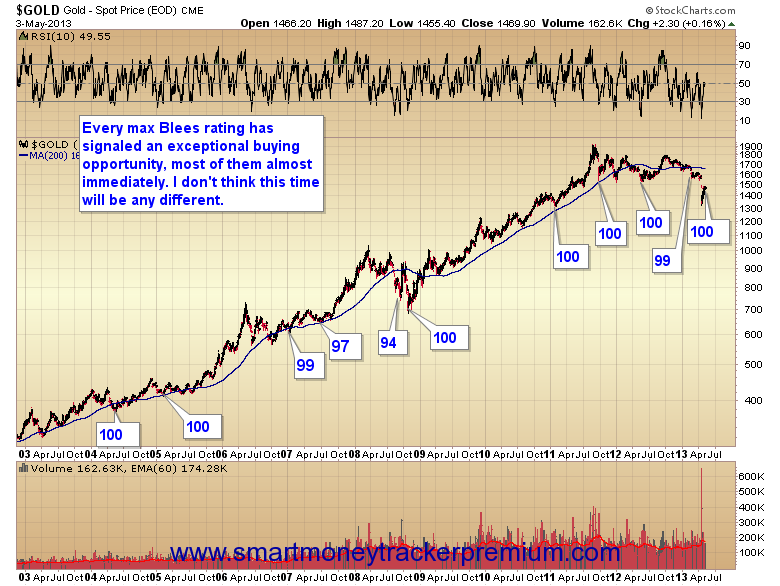 Now we will turn to the Blees Rating with another pair of charts. The Blees Rating is simply a calculation that uses the COT report data on the positioning of commercial traders in comparison to their positioning 18 months previously. The first chart is one that I made. 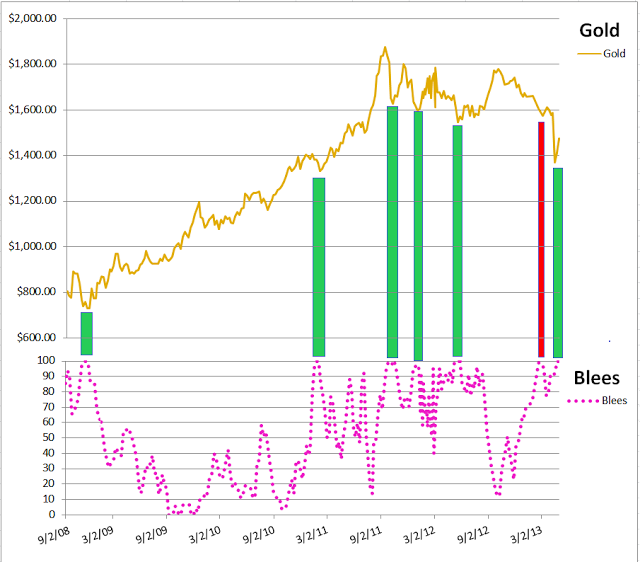 It looks at the price movement of gold since September 2008 in the upper portion of the graphic, and displays the corresponding Blees rating in the lower portion of the graphic. The Blees rating this week, for the second week in a row, is 100. The green bars I added to the chart are intended to draw your attention to price action once a Blees rating of 100 is triggered. First up is the commercials (dark blue line) and their net positioning of gold futures contracts since 2008. The price of gold is shown in magenta. This group of traders is considered the smartest of the players and are hedgers by nature. It is indeed rare to find their net positioning anywhere near to just slightly short, as they are now positioned. Incidentally, they are now positioned exactly as when they correctly called the 2008 bottom. In Mr. Arensberg's accompanying dialog with these charts he noted that the commercial traders method of operation is to add shorts as price rises and add longs (or sell shorts) as price falls. But interestingly, as gold has been raising $150 over the past two weeks, the commercials have been doing just the opposite of their norm. Instead of adding to their shorts as price has gravitated higher, they have reduced their shorts and added to their longs. Yowzer! My take is that the commercials are essentially saying to the market, "bring it on". 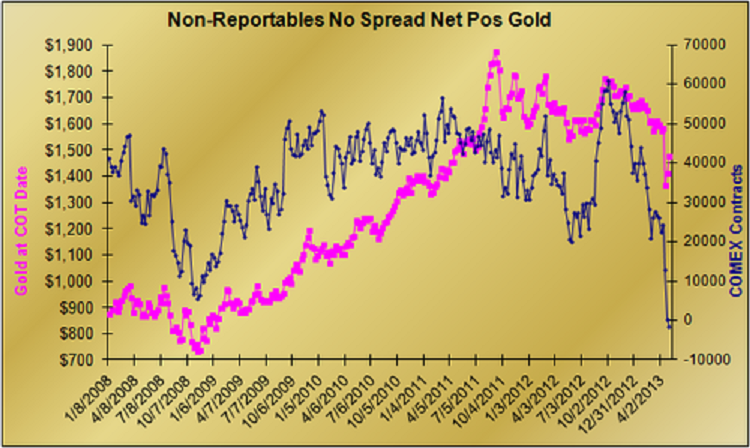 Now for the chart of the little guys trading gold futures, otherwise known as the non-reportables. 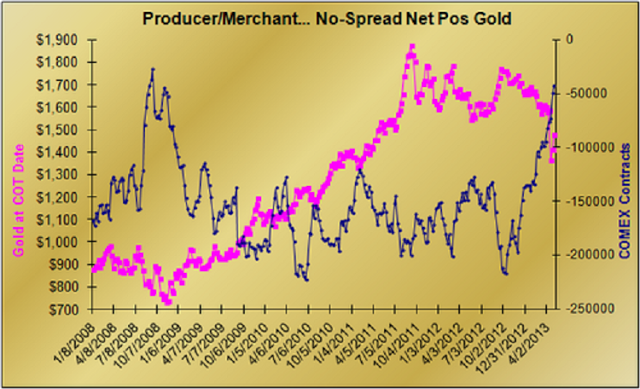 And finally we conclude our pondering of 9 charts with this daily chart of gold futures (/GC) from 2007 and forward. I created this chart and have added in the lower panel the Ulcer Index indicator. This is a volatility indicator that measures downside risk. The higher the indicator reads the higher the risk is considered to be if one continues to hold 'Old Turkey'. So there you have it. Sentiment on GLD and SLV options is crazy extreme, Hulbert's Gold Sentiment Index reveals sentiment is not only more bearish than the 2008 bottom - it’s more bearish than any time in the past 17 years (at least). The Blees Rating has been at the max of 100 for two consecutive weeks. The smart money commercials of the Comex gold futures market, despite the $150 rally we have had off the capitulation low a couple of weeks ago are not being shy. Price has been going up and they have just added to their long positions and reduced their short positions. Meanwhile the non-reportables have played themselves right off the field and will have to become buyers to get back in the game. And finally, the Ulcer Index confirms that gold has taken a hit that should have left EVERYONE running for the door.